Click on the links to visit the recommended websites. Find out about the Big Bang and try a timeline challenge. Blast off on a Mars adventure or solve a Mars word puzzle. See spectacular pictures of stars and planets, find out about the Hubble Space Telescope and explore astronomy. Lots of space stories, games and activities. Learn about animals and insects with puzzles and games. Find lots of science activities by clicking on an age group. Watch a short clip of a scientist demonstrating the chemistry of fireworks. Play a game about the elements in your home. Read the latest news about science innovations. Astronomy, genetics, zoology and other branches of science with fun things to do online and at home. Try a quiz and find out what kind of science jobs might be right for you. Experiments to try at home. 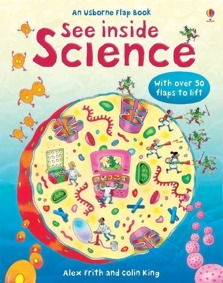 Fabulous flap book that demonstrates basic scientific ideas in a simple and engaging way. Each double page shows key ideas from a different branch of science, including astronomy, ecology, chemistry and physics. Reveals the secrets of how our world works and provides children with a strong foundation in science. Includes internet links to websites with video clips, games and activities to find out more. This book was about science, space, the sky, the smallest things, the jungle, mixed reactions, putting things together, seeing into the future and the secrets behind everything. The pictures were very good... I think my friends would like this book. In fact, one of my friends in my class (primary 2) has it now. I gave this to my son Jack (age 6.5), he loves it and has been firing questions at me ever since! I really enjoyed page 12 because of the robot. I like all the gadgets and pictures.